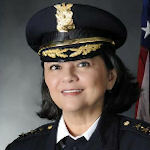 February 18, 2016 -- Mayor Sylvester Turner has selected Martha Montalvo to serve as the City’s interim chief of police. Montalvo will assume the position being vacated by Charles McClelland, who is retiring effective February 26, 2016. She has 35 years of service with HPD. Most recently, she has worked as McClelland’s chief of staff, providing administrative support to the chief while also having direct supervision of 128 officers and 60 civilians in five divisions at HPD. Montalvo will serve until the mayor makes a decision on a permanent replacement for Chief McClelland. She is the first Hispanic and the second female to hold the position. Montalvo started as a beat cop in May of 1980. She has progressed through the ranks of sergeant, lieutenant, captain and assistant chief of police. Her career highlights include coordinating the development and implementation of the Crime Analysis System Enhancement GIS mapping system that is still used today, implementation of technology upgrades and serving as incident commander for the 2004 Major League Baseball All Star Game and the 2006 NBA All Star Game. She has a Bachelor of Science from the University of Houston/Downtown and a Master of Science from Sam Houston State University.